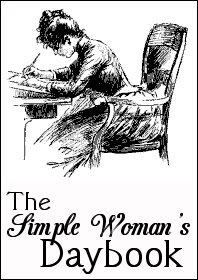 Go to The Simple Woman's Daybook for more Daybook posts! Peggy would be happy to have you! Outside my window~GREEN! It's beautiful! The leaves are back on almost all of the trees, and the beautiful green color that Georgia is known for, is finally back! I moved my computer to a desk in my bedroom, and literally all I see out my front window, is green trees of all sizes and shapes, green grass, sunshine and birds! How glorious! I am thinking~that I really need to finish painting the front deck now that the wasps and pollen have settled down a bit!....I can see part of it out my window too...needs to be finished! I am thankful for~God's beauty outside, and wonderful Christ honoring music that can lift up my spirits and make for a great day, even when I wake up grumpy. I am wearing~a nightgown still. Does that surprise you? I'm working on some daytime clothes, I really am. I am going~absolutely nowhere today! I am going to enjoy Home Sweet Home today. No piano lessons for two weeks, no doctors appointments, no plans....except to enjoy our home, get caught up on schoolwork and housework! I am currently reading~my spare time is limited to Bible reading, and learning more about the supplements I am selling, and using. I am hoping~to get a lot of laundry done today...hubby really wants it all caught up. On my mind~I think I may have a cavity that is going to be a hole in my tooth if not taken care of. We still don't have insurance, and can't afford a filling without it...so the tooth may just have to be pulled out one day. I'm trying to leave it all in the Lord's hands, and not fret. I just keep thinking about it, because I've had a hole in my other back tooth before, and it got infected and caused me GREAT PAIN. I just don't want to go through that again. Noticing that~what we did in the front yard this past weekend really made a difference. I'm still shocked every time I step out the door or pull up in the driveway! A nice shock! From the learning rooms~getting started again this week, after a long spring break. Only 6 more weeks to go to finish the school year! From the kitchen~nothing exciting. Just some BBQ chicken today, and some cornbread...wait...that is kind of exciting! Around the house~so much to do. Laundry, moping, dusting, sorting. One step at a time! Thanks for sharing your day. I understand about the laundry. It seems to always be there, doesn't it?? I love stay-at-home days...those are my favorite. I love your picture. Is this your lake? Gorgeous picture! And love the new template! Thanks for visiting! 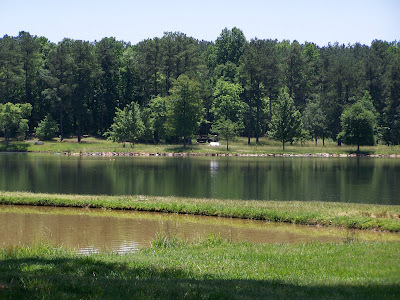 No, this isn't our lake, unfortunately...it's a lake and catfish pond a few miles north of our house. We like to go fishing there when we get the chance. You will never leave, without catching anything at this spot! I am definitely enjoying spring this year. The blue sky and green everything - I was desiring these days so much! When's dinner? BBQ chicken and cornbread sounds mighty delicious to me! We are noticing all the green coming out on the trees too. I love a day at home going no where - in fact that is how it usually is around here. I hope you had a good day at home. Thanks for visiting my blog and for sharing your life with us.